Are you looking for tree removal in New Jersey? A tree in need of removal is a danger to your home and its occupants. Whether you have a weak tree, or a tree damaged by a violent storm, there's no telling when that tree may fall, possibly hitting power lines, cars, your home, etc. Don't let this happen to you. Let Amazing Tree Services safely remove your problem tree. Don't wait to get your weak, old or damaged trees removed from your property. Avert the risk presented on your home, your car, and your family. Amazing Tree Services can help you with safe and affordable tree removal in New Jersey. For more information or for a tree removal estimate in NJ, contact us at 973-343-6868. We look forward to helping you. Check out our reviews on Angie's List! 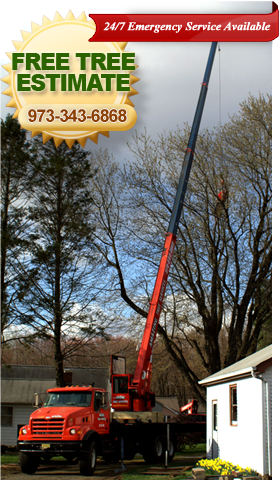 Are you looking for tree service in Morris County, NJ? Let the tree care professionals at Amazing Tree Services help you. For years, Amazing Tree Services has offered the homeowners and business owners of Morris County with affordable tree services they can count on. Our tree care specialists can assist you with a wide variety of tree services to ensure the trees on your property are well maintained and taken care of. Let us help you with the tree service in Morris County, NJ that you need! If you are interested in our tree care services and would like more information, please visit our website or call us at 973-343-6868. Call us for a free tree service estimate in Morris County, NJ today!